It was another wildlife week at the Lake - a bear, deer, coyote, the bald eagle family, an osprey and plenty of people. And we can't forget the thunderboomers, lightning, rain and hail - yup, it was a wild one! Even the fishing was on the wild side - lots of limits coming out with many of those limits including trout well over the 2 pound mark. Just about anything you threw at them, they took. 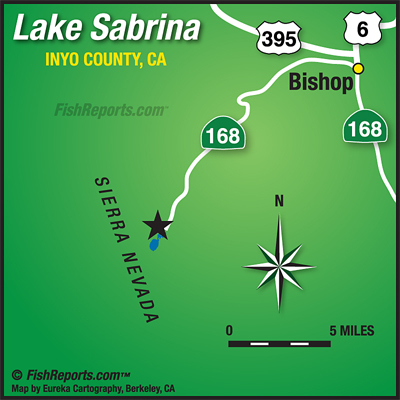 Of course the Inlets were wide open - NightCrawlers, PowerBait, Salmon Eggs, Lures and Jigs. Trolling flashers with a NightCralwer or WoolyBugger (fly) or just dragging a NightCrawler (remember that swivel). Drifting with a NightCrawler or PowerBait. Shore fishing with PowerBait or tossing Lures. Got a nice stocking from DFW on Monday. 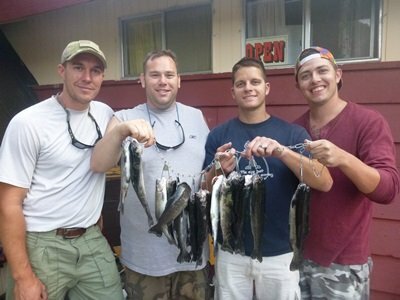 Sierra Slammers were the choice for Harken Maguire, Nathan, Zane & Zack Ashbrook hauling in limits of 2 pound-plus trout, while Harken bested the fam by bringing in a 3-pounder. Huntington Harbor Anglers Jim Armor and Marc Platt limited with Jim claiming bragging rights with a 3-pounder caught on a NigthCrawler. Shawn Benson nabbed a nice 2-3/4 pounder on a NightCrawler and Danny & Myrna Frausto caught a 2-1/4 pounder also on a NightCrawler. Kelly Peeler caught a 2 pounder using PowerBait and Michael Silveira also caught a 2 pounder on PowerBait Nuggets. Looks like we should be drying out for a bit, but just in case don't forget your PONCHOS & a JACKET. Temps are expected to be in the mid 70s with the lows in the low 50s - DON'T FORGET YOUR JACKETS (can't say this enough)! You can also check out www.weather.gov - enter Aspendell, CA (which is the little community right below Lake Sabrina) in the search field and you'll get the forecast for the higher elevation or take a look at Howard Sheckter, our local weather 'guesser' report at www.MammothWeather.com.